When did modern Sudoku puzzles become popular? What other variations of Sudoku puzzles exist? Do you like puzzles? We're not talking about the kind of puzzles that consists of 500 pieces you have to fit together to make a picture. We're talking about puzzles that test your brain in the areas of language, logic or math. Puzzles are a favorite pastime for people of all ages. Some people look forward to doing the morning crossword puzzle in a local newspaper as they have breakfast. Others enjoy putting their brains to the test as a way to become smarter. Still others do puzzles to pass the time or as a hobby. One of the most popular puzzles today is called Sudoku. A Sudoku puzzle consists of 81 boxes arranged in a 9X9 grid. That means there are 9 rows and 9 columns. There are also 9 sub-grids — sometimes called boxes or blocks — arranged in 3X3 groups. Sudoku puzzles feature numbers, but they test logic more than math. 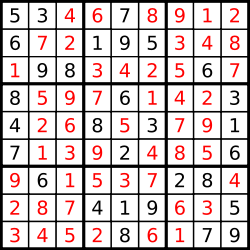 The goal of a Sudoku puzzle is to fill in the boxes with the numbers 1 through 9 in such a way that every column, every row and every 3X3 sub-grid contains all of the numbers 1 through 9. Each digit 1 through 9 may be used only once in any particular column, row or sub-grid. Here is what a completed Sudoku puzzle looks like. Sudoku puzzles start out with a few digits already filled in. Usually, a Sudoku puzzle has only one possible solution. Although they may sound easy, Sudoku puzzles can be very challenging. Number puzzles began to appear in newspapers late in the nineteenth century. A puzzle very similar to a modern Sudoku puzzle appeared in a French newspaper in 1895. The modern version of the Sudoku puzzle was probably created by a retired architect from Indiana named Howard Garns. His puzzle — called Number Place — was first published by Dell Magazines in 1979. Japanese puzzle company Nikoli introduced this type of puzzle under the name Sudoku — which means “single number" — in 1986. By 2005, Sudoku was extremely popular all over the world. Today, there are many different variations of Sudoku puzzles. For example, young puzzle lovers often prefer smaller versions of Sudoku puzzles, such as 4X4 grids with 2X2 sub-grids. There are also larger versions, such as the Sudoku-zilla puzzle published in 2010 that featured a 100X100 grid! Some puzzles even replace numbers with letters and are often called Wordoku puzzles. Sudoku puzzles have also moved well beyond newspapers. Today, you can do Sudoku puzzles in special books full of puzzles, as well as on mobile phones, computers, websites and even video game consoles. There are even World Sudoku Championships held each year now in various countries around the world. Tomorrow’s Wonder of the Day is the way to start the day off right! We're glad, Amara! Do you like Sudoku puzzles? That's awesome, jami! We hope you had fun learning more about Sudoku puzzles from this Wonder! Sudoku is kind of hard. I still don't have a strategy. I wonder how it spread so quickly? It's me again I still love it. I was doing it yesterday and lost because it does not like me!!!!!!! Yeah! It's really fun you should try it! Just turn on your thinking cap and you can roll! We are thrilled to hear that, Kaito W!! Thanks for being our Wonder Friend!! I do Sudoku all the time! Hi wonderopolis I really LOVE sudoku and I even have my own sudoku book! My grandma and I think tomorrow's wonder is going to be about a positive attitude and a good breakfast. I enjoyed today's wonder my grandma always does that when she in her car waiting for us to get out of school or when she gets bored. Yay! I am the first WONDERer! My dad, sister and I all love to do sodoku, although I sometimes have troube with them. If I do, my dad helps me. I play sudoku it's very fun!!!!!! A type of puzzle whose completion requires each of typically nine rows and columns and each of as many usually square subregions to contain, without duplication, 1 up to 9 or the grid dimension.